are just as important as the holiday itself. 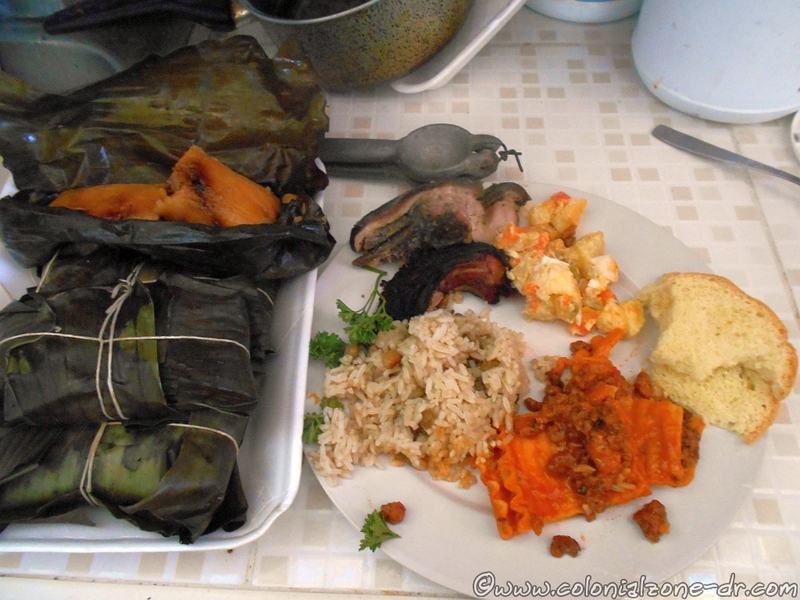 Without the special traditional dishes, lovingly prepared, Navidad just would not be the same. is always one of the holiday favorites. They are easy to prepare and easy to serve. Since there are always guests in the house or people visiting one can always find some soup/ asopao or sancocho (recipe for sancocho) cooking and ready for serving during the entire holiday season. is a big celebration and a very large and substantial dinner is served with food, food and more food. Food and family. Food and friends. Food and neighbors. Usually, there is lots of drinking as well. Everyone is stuffed to the brim and still desires more. Christmas Day is for left overs and recuperation. prepared painstakingly by the ladies, sometimes men help a little, are so incredible. The aromas, along with the ambiance, throughout the house are wondrous. and Roast Chicken/ Pollo Asado is very important. The Pork is my favorite. I love the crispy skin. is splendid. It has cooked potatoes, peas, carrots, egg and a little mayonnaise. This recipe is usually a family secret. which always seemed more of a red to me because of all the tomatoes. are everyone’s all-time favorites. Not easy to make but worth the time and effort (My Dominican family, as do many other families, cheats and buys them pre made). 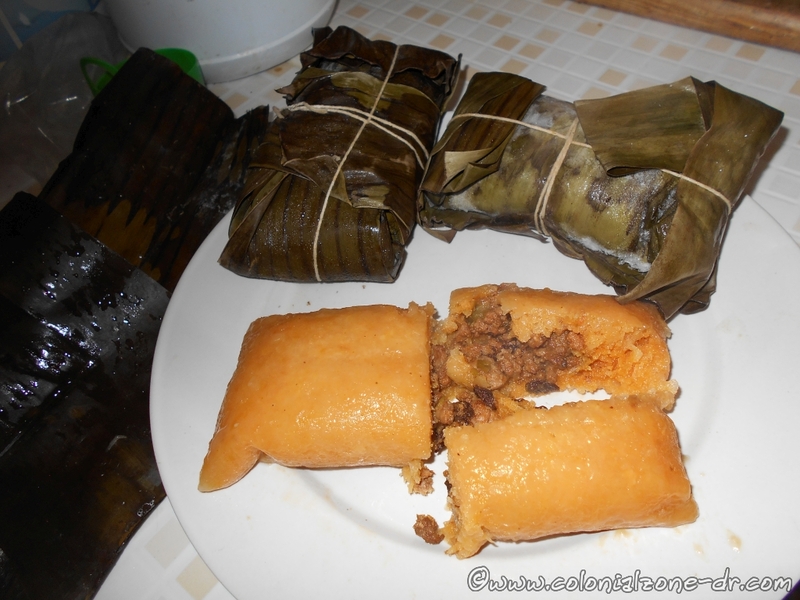 Closely resembling a tamale they are wrapped in a banana leaf and tied with string to make a nice little torpedo shaped package. Inside this green wrapping is a yellow roll filled with res/ beef, cerdo/ pork, pollo/ chicken, pescado/ fish, bacalao/ cod fish, queso/ cheeze, vegetales/ vegatables or a mixture of a few of these. Served steaming hot one could add a little kechu/ ketchup, salsa picante/ hot sauce, mayonnaise/ mayonesa or eaten plain. Any filling or any condiment topping them for me is wonderful. They originated in San Cristóbal when doña Isabel Coiscou created the recipe and started distributing the tasty food throughout the island. is a Long, Crusty bread. This bread is what we wait for. It has such a great flavor we always buy more than we need. It also makes a great crust for pizza toppings. Sweets, Cookies and Cake/ Dulces, Galletitas y Biscochos. These are a given as gifts and served to guests as well. There are so many varieties to chose from, including the Christmas Pudding/ Pudim Navideno. are abundant before and after dinner for munching. In the past Apples/ Manzanas, Grapes/ uvas, Pears/ peras were considered very special as they were not readily available like they are today. My friend told me that when she was young and received an apple it was a very special treat usually reserved for the Christmas season. Some of the nuts that are Christmas traditions are Hazelnuts/ coquitos, Pan de Fruta (served nice and hot), Almonds/ almendras and Walnuts/ nueces. These are many times brought from the USA as a present/ regala from visiting family. We always tell family and friends coming for holiday to make sure they bring us nuts. , of course, include red wine with dinner and rum. There is also Eggnog/ Ponche de huevos, sometimes with some rum added for good measure. The after dinner drink, Anis del Mono/ Monkey Anise, is one of my most favorite. 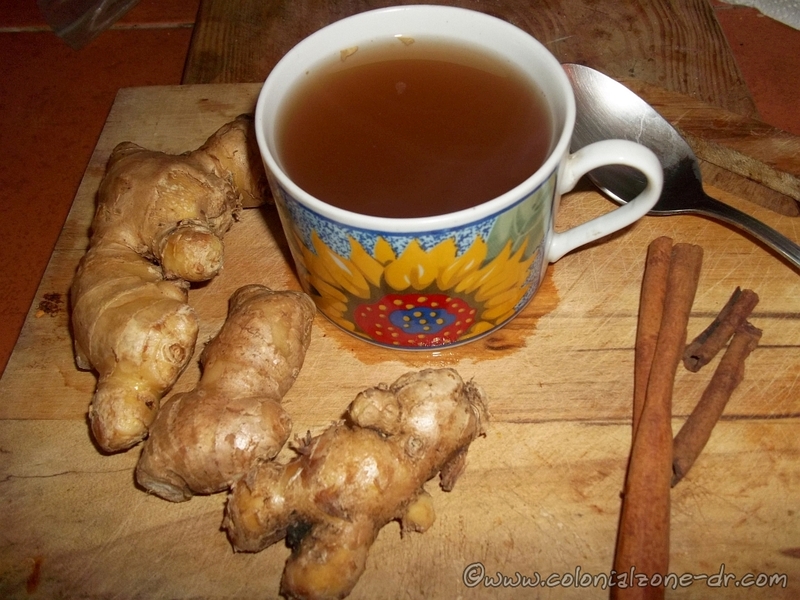 It is an anise drink that that many people make in the home for the best flavor. The Aunts/ Tias of a friend of mine makes the best I ever tasted. when everyone has stuffed themselves to the brim it is time to relax. We pull up the chairs and sit on the porch. Talking to the people in the street passing by. Everyone is so festive. The ladies go to the neighbors that can’t get out or cook for themselves and take plates of food. We drink some rum or some beer and enjoy. It’s fun to make the rounds and stop and visit some close friends. But always end up back home to hang out with the family. Even for me, I have no blood family in the Dominican Republic, my adopted Dominican family has made me feel like one of them. I am right at home and they accept me during all holidays and special occasions.